Mike Lohr is standing in front of "Self Portrait #2" by John Smart. A C-Print mounted on Masonite and standing an impressive 72" tall by 48" wide. This piece is still available there are signed and framed 8" X 12" prints available in an edition of five. The artist's father Jim Smart is entering the gallery alongside "Joshua Tree Lomo" which is a C-Print mounted on Masonite, 52" X 36". This is also available in a signed and framed 8" X 12" size - edition of five. "Untitled #2" is a C-Print mounted on Masonite, 48" X 48". The guest of honor and his grandmother. "Joshua Tree Collage" five frames mounted on Masonite and assembled together, aproximately 56" X 56". Master Craftsman Manuel C. Caro of Mandala Custom Shapes spun records all night, and was quite pleased to acquire the marquee print of the evening "Untitled #1" which was also used on the showcard. The large version behind Manny stands 72" wide by 48" tall and is a C-Print mounted on Masonite. There are smaller signed and framed prints available in an edition of five. I believe there are only two left. To everyone who made it out to the show, thanks for coming out. 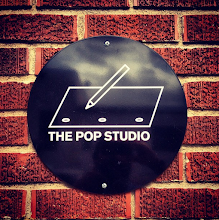 If you happened to take any good photos, please send them to LaurenW@thePOPstudio.com. If you are looking for a price list, you can also email Lauren. And if you're looking for more info on the show, link through to the POPgallery site, and we'll be posting an expanded look at the opening in a few days. And for more information on the artist, photographer and filmmaker John Smart, you can visit his website here.